MARYVILLE, TN (March 26, 2009) ~ Today Moomba formally revealed their all new 2009 Wake Wrap Collection for Moomba boats. Moomba’s exclusive new collection of Wake Wrap designs offer customer’s the ability to customize the colors and wrap size of their choice with the option to add custom boat numbers to match their wrap. In addition, Moomba buyers also have the opportunity to design their own custom wake wrap. The possibilities are endless thanks to Moomba’s new partnership with ZDecals. The best part about Moomba’s Wake Wraps, other than the look, is Moomba’s partner ZDecals uses only the best materials from 3M coupled with 3M protective UV laminations and 3M approved inks. So you can expect the wrap to last at least 8+ years outdoors. Moomba’s Collection of Wake Wraps are, well, see the designs for yourself at https://download.yousendit.com/TTZsR0lWSWhRR2V4dnc9PQ . Tell us what you think. A Moomba Owner who recently wrapped his new 2009 LSV explained, “Each time I pull up to put gas in my boat, it ends up being a 45 minute deal answering questions about the boat, it’s design, where to get it and so on.” Nice! 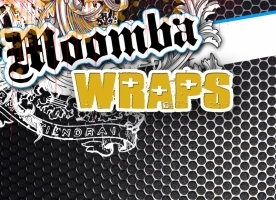 To get the latest and greatest in wake wraps and customization opportunities, contact your local Moomba dealer. You can find your local dealer with our dealer locator at http://moomba.com/dealer.php. Hmm… A little about who we are? Well, one thing is for sure, we love what we do. We don’t aim for perfection, we aim a little higher. Not sure what that would be called, but hopefully you get it. We only expect perfection from each other day in and day out. From the fresh designs from our designers, the vibrant colors that roll off our printers, to the over the top graphic installations, our customers should have no doubt that they’re dealing with the best. Now we have to be honest, the reason we go nuts on quality is we really don’t want to see your wrap back in our shop and we like it when you spread the good word. We’d rather see you catching some big air on the weekends and doing a little bragging here and there. We’re here to do one thing… create cool stuff and hear people say “how did you do that?! ?” If you’re looking for something different and a team you can trust, you’ve found us. Skier’s Choice, Inc. is a leading manufacturer of performance inboard wakeboard and water-ski towboats under brand names Supra and Moomba. Supra has been a leader in the inboard industry since 1980 and is synonymous with innovative styling, luxurious interiors, highest construction quality, and unsurpassed wake performance. Moomba is a value-oriented brand that offers significant savings yet delivers performance and reliability equal to or better than other inboard brands. Skier’s Choice sponsors the WWA World Wakeboard Championships, BROStock, EuroBro, IINT and NWL amateur events. Located in Maryville, Tenn., the company is closely held. For more information, please visit www.moomba.com .